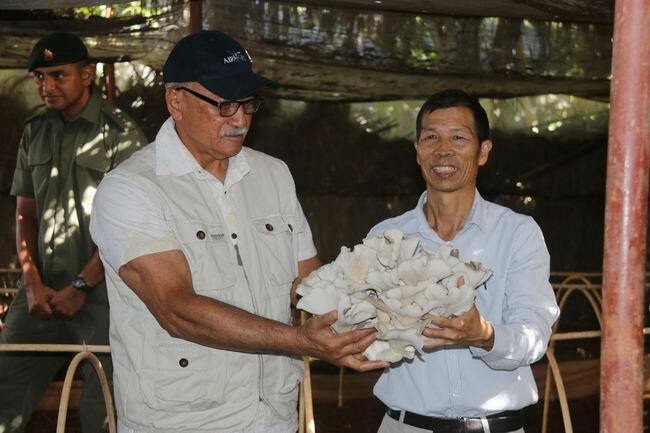 Thanks to the Juncao Technology, a Fiji-China agricultural project, Fiji no longer needs to import mushrooms from other countries to meet its domestic demand, guancha.cn reported. Fiji's president George Konrote visits the Juncao Technology center with Chinese ambassador to Fiji Zhang Ping in June 2016. Due to its high temperature, Fiji does not have a favorable growing environment for mushrooms, explained a Chinese expert group at the technology demonstration center in Fiji, adding that people originally had to pay for the expensive food to be imported. However, experts at the center, built in 2014, made efforts to overcome the climatic conditions and successfully plant mushrooms for the Fijian people. The project could help small island countries develop sustainable agriculture, reduce poverty, achieve Sustainable Development Goals, cope with climate change and promote renewable energy, China’s ambassador to Fiji, Qian Bo, said at the capacity building workshop on Juncao Energy in Nadi on June 4. Fiji currently imports mushrooms totaling 500,000 Fijian dollars ($242,758) annually and the demand is set to grow with the boom in tourism, according to a report by Lin Zhanxi, inventor of the Juncao Technology at Fujian Agriculture and Forestry University. The university's official website shows that since the center's launch, it has cultivated eight varieties of mushrooms for locals, alongside Juncao grass for pasture farmers, trained 498 local technicians and helped the Fijian people with post-disaster reconstruction. At present, China has created such technology cooperation bases in Papua New Guinea, South Africa, Rwanda and Lesotho, and spread its Juncao technologies to 101 countries worldwide.